The Red Deer & District Labour Council is encouraging all affiliates, members and friends to attend the Celebration of its 60th Anniversary which will take place this year in mid-October. 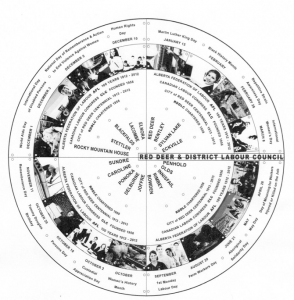 The Council is planning to mark this occasion by unveiling a large stainless steel Disc commemorating the history of labour in the Red Deer area, a Project that took six years of dedicated work. was conceived six years ago by the Red Deer & District Labour Council as its contribution to ‘Project 2012’ a joint initiative with the Alberta Labour History Institute (ALHI) to celebrate the Centennial of the Alberta Federation of Labour (AFL). Labour activists in Red Deer decided to mount a highly-visible piece of art in their downtown to serve for generations to come as a reminder of the work their members do to serve Red Deer and surrounding area. The Council commissioned a large stainless steel disc, approximately 3 metres (10’) in diameter, together with a plaque that would explain the Disc’s significance and recognize all its donors. In addition to canvassing local unions for funding, ALHI applied for and received over $30,000 from the Alberta Culture’s Community Initiatives Project (CIP). After a number of setbacks, work on the disc was finally completed this year, just in time for the Anniversary Celebration.